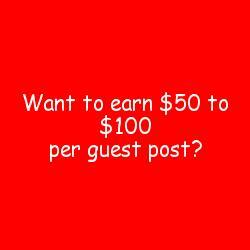 Want to earn $50 to $100 per guest post? Only yesterday I was talking to my friend Nirmala Santhakumar, the author of http://mymagicfundas.com about the demand that I noticed for blog posts and articles by feelancers. Now, just a few minutes ago, I stumbled onto a resource that pay $50 to $100 per guest blog post. Since that pay is very big, obviously, very standard is expected from freelance bloggers. Now, I am going to do a little experiment. Before revealing the source for earning $50 to $100 per blog post, I want to find out how many people read this blog post. If you want to know who pays that much per bog post, please comment on this blog post with your name and email; I will email you the source URL. I promise not to store your email. You will never hear from me after you receive my email only once.